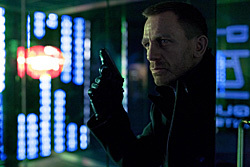 While Hollywood experienced a weak weekend at the box office in North America, the 23rd James Bond adventure Skyfall took over international theaters and earned an impressive $77.7 million from 25 markets, opening in first place in each market. In the UK alone, the Sam Mendes-directed film opened to $32.4 million, which is the second-biggest opening weekend ever there, trailing only Harry Potter and the Deathly Hallows – Part 2. The Columbia Pictures and MGM release, starring Daniel Craig, Javier Bardem, Dame Judi Dench, Naomie Harris, Berenice Marlohe, Ralph Fiennes, Albert Finney and Ben Whishaw, will open in over 60 countries before it hits North American IMAX theaters on November 8 and conventional theaters on November 9.